I find it strange how quickly one’s perception of ‘good fishing conditions’ changes when you learn something new about fish behaviour. Total confidence in my ability to predict good fishing days was doomed by forced outings in ‘bad’ weather due to a serious lack in free time of late. Balmy, sunny days (according to the weather forecast) used to be highlighted a week ahead in my fishing calendar. Uncertainty swam in when I started catching dusky kob in the middle of Cape storms, which was completely coincidental with a spring tide on the first trip. “But that’s saltwater fish”…I thought…”And that’s different”…Right? Wrong! 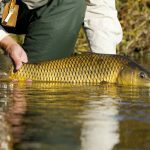 When Pete and I had a memorable day on a tough Berg River section in torrential rain (in fact one of the best day’s fishing I’ve ever had on that river – see Thundercats and carp in the poo hatch of 2015), my way of thinking changed. We watched in absolute amazement how schools of carp and catfish were attracted to storm water pipes pouring industrial waste, animal remains, litter and bergie poop with rain water into the river. It was as fascinating as it was disgusting catching fish in the stench. Regardless of my self-pity, I reluctantly pulled my rod from in-between my car seats and strolled along the Berg’s banks to see if there were any fish feeding in shallow water. I found the swollen, brown river even more depressing, but decided to carry on walking in the rain as there was nothing else to do. A swirl in bankside vegetation that got flooded near the tail of the pool changed my mood. “Perhaps the carp are foraging for food in the freshly covered grass after all?” I thought as I slid down a steep mud bank to get a closer look. A carp tail appeared in the middle of the ‘nervous’ water, which put me on my knees. I was about three meters away from one of the biggest fish I had ever seen in the river. The silhouette of the fish was difficult to spot in the poor light, but once I could see where the lips were I tossed a small worm-fly out in front of it. The carp lazily swam forward and gobbled it up without hesitation. Its casual reaction was very unlike trophy carp behaviour and I figured that it simply didn’t expect to find a human ‘hunting’ in the rain. In fact, there wasn’t a soul in sight. The fish bolted off and did a few humpback whale flops as it ploughed through muddy shallows, dodging sticks, tyres and beer crates towards the opposite undercut bank. Reluctant to wade after it I tightened the drag and the line suddenly shot back at me like elastic. The hook broke on the bend, but the unexpected action got me very excited, which overwhelmed dismay. With more energy, I continued to tip toe along the soggy edge and found two more large fish grubbing along the grassy bank. As previously, the fish I picked out ate the fly aggressively and even lifted its head for a few seconds in disbelief, trying to spit the fly after I had set the hook. Then it saw me standing practically next to it and followed the same route in a similar self-destructing manner to the far bank. This time I jumped in and ran after it. The fight was short and powerful and the fish was still fresh when I netted it, fresh enough to shred the net. 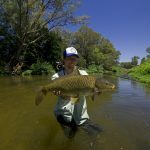 It was not as big as the one that got away, but still the biggest Berg River carp I had landed. I stared at my dream catch, a fish and situation unjustifiable by film, which I finally caught in extraordinary circumstances; a day I would never have considered promising for fishing. I released the well-conditioned full scale and continued searching for feeding fish in the layers of muck that accumulated in bank eddies. It would have been a perfect day if I returned home then, but I stayed long enough to see the catfish ‘skimming’ the scum lines and sight fishing to these was the cherry on top. 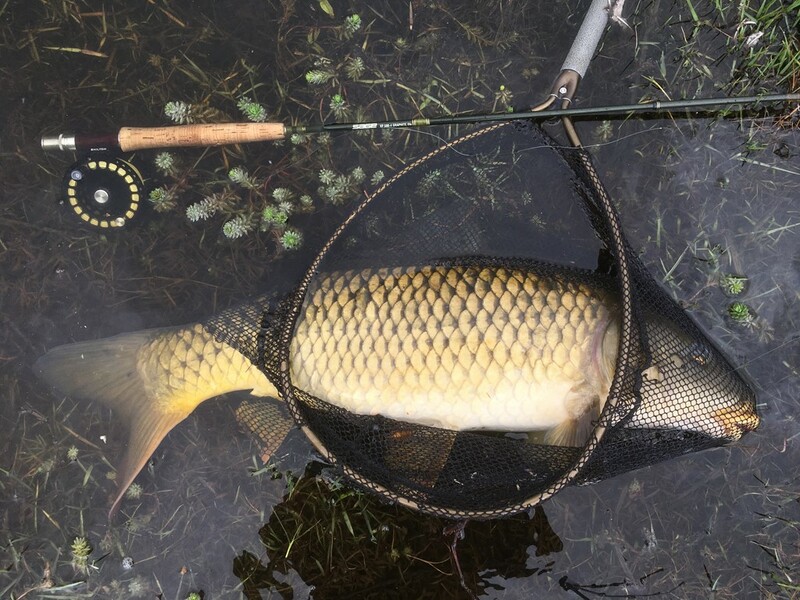 Life’s certainly become more interesting since these findings – carp in the rain and even carp at bass spots – but I’m dreading the misfortune involved in working through all the potentially fishless trips to find the new general trend. It also makes one wonder just how many good days we miss out on because of our predilection for ‘pretty’ weather, because it seems like the fish bite better when it rains.